Rah_tabtor makes it possible to move Textpattern CMS’ admin-side navigation items around in the in the main menubar. This allows moving admin-side panels from a menu to an another. For instance, with rah_tabtor you can move a plugin generated navigation item from the Extensions to the Content menu. Rah_tabtor let’s you to clone and cut backend’s navigation links from a tab area or a dropdown menu to an another from a nifty looking admin-side panel. Whether a menu item can be merely cloned or cut depends on the origin of the item. This comes down to technical and implementation limitations. A plugin generated menu item can be cut and moved from the original spot, while built-in core items can only be cloned, creating duplicates. Removing the original menu item is not possible when it comes to core menus. When rah_tabtor is used for a plugin generated menu item, the item can be cut or cloned by your choosing. The modified menu item is removed from the original spot and presented in the set target location or multiple locations. Multiple menu items that point to the same panel are created by creating additional rules for the same target menu item. Due to limitations, built-in core menus can only be cloned. Original menu items can not be removed or moved in a way or other. When rah_tabtor is used for a core menu item, a clone is created. Rah_tabtor doesn’t hide or remove navigation items, but the plugin’s solely purpose is exchanging items between menus. If you wish to change permissions and hide tabs based on a privilege level, I suggest checking out Redbot’s bot_privs plugin. For creating dynamic panels that allow use Textpattern’s tag markup, see Stef Dawson’s smd_tabber. These three plugins play well together. Rah_tabtor’s installation follows the standard plugin installation steps. 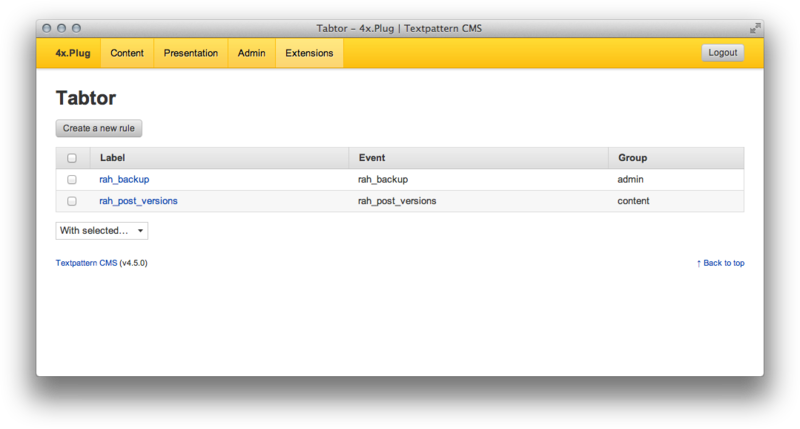 After you have installed the plugin, you can find its user-interface and options from Extensions menu, named as Tabtor. The plugin’s panel allows creating, editing and deleting navigation item rules. 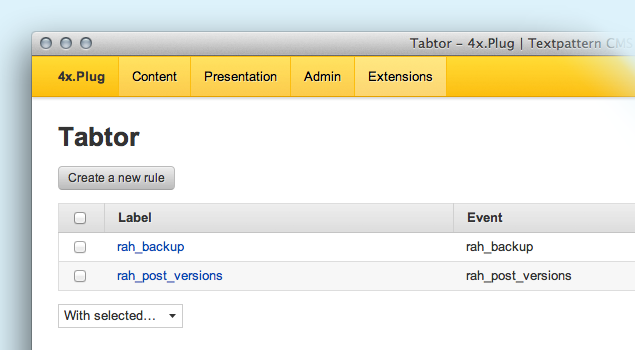 New rules that move navigation items can be created easily directly from rah_tabtor’s admin-interface. From the Tabtor panel you can find a button labeled as Create rule. Pressing this button will bring up an editor. Present will be the following options. Is the name of the new navigation item. The option supports language strings. To use a existing localized language string as the label, type in the string’s name to the field. If the specified label doesn’t match any language strings, it’s displayed as it is. Is the moved menu item. From the list you can find any item that can be moved. Is the target navigation area, menu or tab where the menu item is moved to. Available options are Home, Content, Presentation, Admin and Extensions. Is the menu item’s sorting value, used to change the item’s position in the target menu. The position will not affect existing built-in core menu items. The position is only used among moved menu items. All items that are moved using rah_tabtor will always appear after existing core menu items. This is due to technical limitations. Fixed: Full Textpattern 4.5 compatibility. Improved look and feel. Fixed: Uninstall query’s wildcard escaping. Added: Tell activity message its type (error, success, warning). Helps themes to style messages accordingly. Added: Menu items created by plugins are now moved instead of copied. This doesn’t affect core tabs, which are protected and can not be modified. Improved: Installer now defines default values for the varchar fields. Improved: Sort items in in the list table by their label. Removed: Embedded language strings from the source code in favor of external Textpacks. Removed: Documentation link from navigation. Now requires Textpattern v4.5.0 or newer, and PHP 5.2 or newer. Added: Uninstaller sporting plugin-lifecycle callbacks. Drops plugin created preference strings and tables when plugin is deleted. Added: Now admin-side interface uses language strings and is translatable using TextPacks. Added: “Options” link to the Plugin pane. Changed: Moved preferences from own database table to txp_prefs table. Plugin includes automated clean up script. Changed: Try to run installer only if the version number doesn’t match, instead of letting MySQL to decide. Changed: Markup changes to the admin-side interface; <thead> and <tbody> containers to the tables, rah_ui selector classes to common elements for easier theming. Changed: Shortened the admin-side interface step names. Changed: Inform the user if deleting or updating item failed because of an database error. Changed: Requests sent as GET are ignored when saving details. Changed: Specify charset as UTF-8 when creating new database tables. Changed: Expanded the admin-side pane’s permitted privileges from Publishers to Managing Editors. Removed: Plugin’s own preferences pane.